Saving at JBF, it's Easy! We are open from Thursday, 3/28 to Sunday 3/31. Check out our full schedule below & get your FREE ticket HERE. Shop over 200,000 new & gently used children's & maternity items. 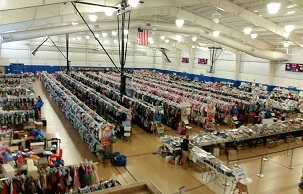 You will find clothing, toys, shoes, books, strollers, furniture, and so much more! See why this sale was named a National Top 10 Consignment five years in a row! Everyone is welcome to shop! We prefer gladly accept cash Visa, Mastercard, and Discover. Free Admission – Everyone is Welcome - New Merchandise Arrives! Our event is located in the Concord Township Municipal complex, directly off of Route 1. We are so thankful our consignors who generously donate to local charities. "I love working for Kelly and Kate, and the deals are amazing. " This sale is extremely well organized and everyone is so helpful. The selection is amazing! Shopping and ability to sell items and get them out of the house and make a little money that I usually spend shopping the event! Ready to MAKE MONEY? You can SELL your items, too!